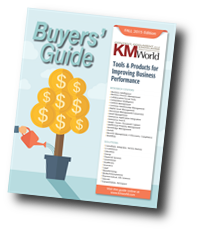 The KMWorld Buyers' Guide offers you access to leading vendors offering real solutions to knowledge management dilemmas that will help users gain and maintain control of their enterprise environment. This year's Buyers' Guide download includes the highly anticipated results of the 2015-16 survey on the State of KM. Find out where budgets are coming from, where the leadership is, and more. Although business process management (BPM) systems initially functioned as a way to improve efficiency in various transactions, they are now central to digital transformation that includes seamless access to documents and data, use of machine learning and development of models to improve performance across a broad range of enterprise activities. System allows technicians to have an online Web-based diagnostic tool.